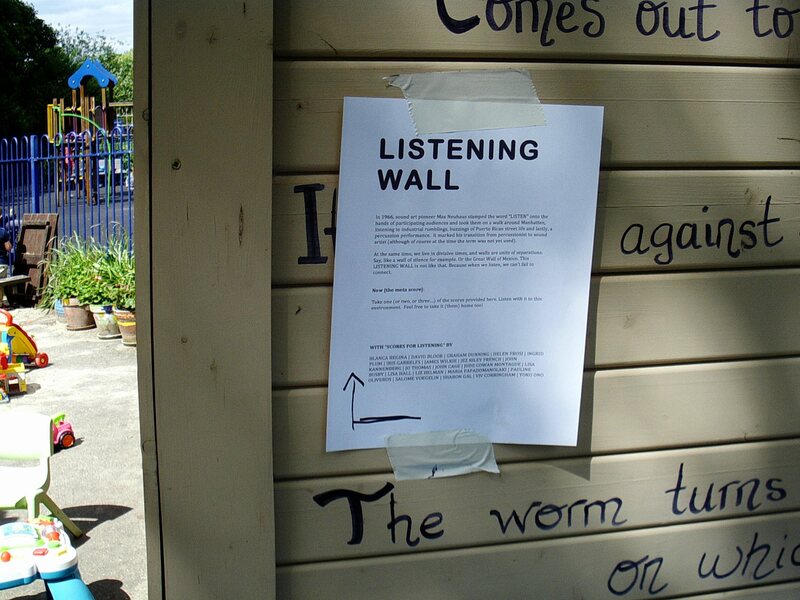 Listening has long been in the foreground of sound arts practice. In 1966, sound art pioneer Max Neuhaus stamped the word “LISTEN” onto the hands of participating audiences and took them on a walk around Manhatten, listening to industrial rumblings, buzzings of Puerto Rican street life and lastly, a percussion performance. Taking Iris Garrelfs’ project “Listening Wall” as a point of departure, this session of PoL will take you on a journey of listening based on a series of scores for listening, created by artists such as Blanca Regina, Cathy Lane, Graham Dunning, Jez Riley French, Magz Hall, Salomé Voegelin, Sharon Gal, Viv Corringham and many more. Each of the scores provides a different sonic perspective through which to explore our surroundings. Some scores focus our attention on the experience of listening and the quality of the sound itself; others aim to instigate relationships with very specific aspects of the audible environment. Others stimulate our imagination or instill mischievous behavior, reminding us that listening does not merely relate, but can also be “… disruptive in its nature” (Westerkamp 2015). This initial listening session is followed by a discussion of participant’s experiences and views on the subject. Questions we might ask ourselves are not just related to what we hear, but also to how we create such identifications, and to what extent listening activities such as these are individual or communal, passive or active. Iris Garrelfs works on the cusp of music, art and sociology across improvised performance, multi-channel installation and fixed media projects. She is interested in modes of listening as a way of connecting to the world. She often works with site, not just as investigations of the geographical, historic or sociological aspects of each locality, but also as poetic evocations of presence on the one hand and presence within a space or situation on the other. Her work has been presented internationally, for example Tate Britain, National Gallery, Royal Academy of Arts London, Visiones Sonores Mexico, Palazzo delle Esposizioni Rome, MC Gallery New York. Residencies have included Grizedale Art, Institute of Modern Art Celje (Slovenia), Onassis Cultural Centre Athens.